Erstwhile Mallabhum, the kingdom ruled by the Malla kings of Bishnupur, mainly flourished to its zenith during the reign of Hambir Malla Dev, popularly known as Veer Hambir (1565 CE to 1620 CE), the 49th ruler of the Malla Dynasty. He was a contemporary of Mughal emperor Akbar (1542 CE to 1605 CE). Enthralled by the recitation of the Bhagavata by Srinivasa Acharya, Hambir converted from Saktaism to Vaishnavism and Madanmohan became the tutelary God of the Malla dynasty. Once on his way home from the pilgrimage, Veer Hambir came across an ashram with a temple in its precinct at Brisabhanupur. The presiding deity in the temple was Lord Madanmohan (another name of Lord Krishna). The priest of the temple informed the king that he was bestowed with the idol of Madanmohan by an ascetic traveller. The ascetic traveller obtained the idol of Madanmohan in supernatural milieu in the dense forest of Deccan region. The effulgent beauty of the idol enchanted the devoted king so much that in his trance he saw Madanmohan. The God Himself directed the king to take Him away to Mallabhum without the knowledge of the head priest. Then Veer Hambir was tempted even to steal Madanmohan at the dead of the night. He secured the idol of Madanmohan in the chamber of Goddess Laxmi in the inner apartment of the palace. On the other hand, the head priest of the temple overwhelmed with grief was on the verge of insanity. He suspected the king to be the plunderer of his tutelary deity. He reached Mallabhum and entreated the king to return his Madanmohan. When Veer Hambir refused all the charges of stealing the idol, the priest threatened with committing suicide. The king fearing being the cause of an indirect killing of a Brahmin confessed his guilt but was reluctant to give up Madanmohan. At last, the tormented priest left Mallabhum with an empty hand. In his parting message, he cursed Lord Madanmohan, “Oh Lord Madanmohan as You quit me in the lure of Mallabhum, likewise some day You will have to leave this holy land.” Needless to say, the curse uttered by the priest proved infrangible. From then on Lord Madanmohan became the tutelary God of the Malla dynasty. Gopal Singha Dev (1712 CE to 1748 CE), the 55th king of the Mallabhum was another great devotee of Madanmohan. King Gopal Shinga’s untainted devotion to Madanmohan made him both famous and infamous. Out of his penchant obsession to Vaishavism, he circulated a strict order in his kingdom that every subject had to worship Lord Madanmohan thrice a day. This was infamously called ‘Gopal Singher Begar’ (forced and unpaid labour done for Gopal Singha). However, the king perhaps never imagined that he had to pay the price for his excessive obsession to Madanmohan. He realised it when vast Maratha invaders, locally called Bargis (light cavalry) under the commandership of Bhaskar Pandit, general of Raghoji I Bhonsle, besieged Mallabhum in 1742. The message of the Marathas waiting in front of the south gateway of the town scared the King Gopal Singha. He realised his folly of ignoring the defence system of the kingdom. Then, finding no other way to protect the town from the aggressive Maratha soldiers, he could not help surrender to their tutelary God Madanmohan and also directed his subjects to follow suit. After hearing the deafening booms of the artilleries, the god-fearing king Gopal Singha woke up from his prostate state. The booming peals of the cannons made the king in his conviction that his beloved God had manifested Himself to protect his kingdom from being ravaged by the Maratha invaders. In the meantime, a cannoneer informed the king that late at night he had found a cavalry boy in blue riding on an enormous white stallion was proceeding fast towards the front at Mundamalar Ghat with a burning torch in his hand and the whole area was illuminated with supernatural light. Watching this strange sight, he swooned. He added that he woke up in the booming sound of the cannons. The narration of the cannoneer made the king’s conviction more steadfast. The king came out of his hiding place and started approaching the Madanmohan Temple. On the way a milkman stopped the king and narrated his bizarre experience. He said that he was intercepted by a boy wearing blue and took the curd he was bringing for Lord Madanmohan at the cost of a gold bangle. He showed the bangle as evidence to the king. The devout king recognised the bangle instantly which was one of the two bangles adorning the hands of the idol of Madanmohan. Then the king reached the Madanmohan Temple. To his utter surprise, the king sniffed the acrid smell of burnt gunpowder. There were the marks of soot in the hands of the idol made of eight metals of Lord Madanmohan, too. Besides, one of the gold bangles in the hand of the idol was missing. The devout king did not need to labour hard to realise that Lord Madanmohan Himself had manifested and protected his kingdom from the fierce enemy. Fireballs were volleyed incessantly from two cannons automatically without any human presence. This is the legend that many Bishnupurians still believe from the core of their heart. However, history does not corroborate this legendary story centring Madanmohan and Dalmadal cannon. Though the king refused to fight, the prince who dissented with his father might have fired the cannons that dispersed the Marathas. However, the tale that circulated in the locality is that when the Bargis assembled in the battlefield of Mundamalar Ghat, a man with a ‘mashal’ (burning torch) was found firing the cannons already stuffed with gun powder and fire balls. The mysterious man might have been a brave soldier who, disregarding the King’s command, fired the cannons. In fact, king Gopal Singh had no proper idea about the power of the artilleries including the great Dalmadal that had perhaps not been used before. That mystic soldier, who might have been afraid of disregarding the king’s command, dared not disclose his identity. The devout king overwhelmed with his obsession to Madanmohan, believed from the core of his heart that his tutelary God had fired the cannons Himself to chase away the bargis and protect his kingdom. According to the legend one of the two cannons popularly used by Madanmohan was the famed Dalmadal Kaman, the great royal cannon that still bears the testimony of terrible Bargi invasion in 1742. The great cannon is preserved by Archaeological Survey of India on an oblong altar surrounded by iron railings in an open space adjacent to Chinnamasta Temple. Dalmadal or Dalmardan is a compound of two Bengali words. Dal means horde or group and Mardan means slayer. Therefore, the name of cannon indicates it was a mass destroying artillery. Dalmadal is still revered as God’s artillery. After about two hundred years of the installation of Madanmohan in the Mallabhum by Veer Hambir, the irrefutable curse by the ill-fated Brahmin to the God proved true. Chaitanya Singh Dev, the 56th king of Mallabhum, ruled from 1748 CE to 1801 CE. The king with his tutelary God, Lord Madanmohan, spent some years in a rented house in Kolkata. There he had to stay for his entanglement in court cases and ran into debt. Then he was compelled to mortgage the idol of Madanmohan to a wealthy salt merchant of Konnagar. According to popular sayings handed down from generation to generation, the king despite his earnest endeavour to redeem Madanmohan in exchange of his all belongings was deceived and Mallabhum was deprived of the real idol of Madanmohan which is now placed in the Madanmohan temple at Bagbazar in Kolkata. There is another legend. Two identical idols of Madanmohan were shown to the king. Guided by Lord Modanmohan Himself, the king detected the genuine idol noticing it sweating profusely and a white fly sitting on its nose. However, there is much room for controversy about the whereabouts of the original idol of Lord Madanmohan. 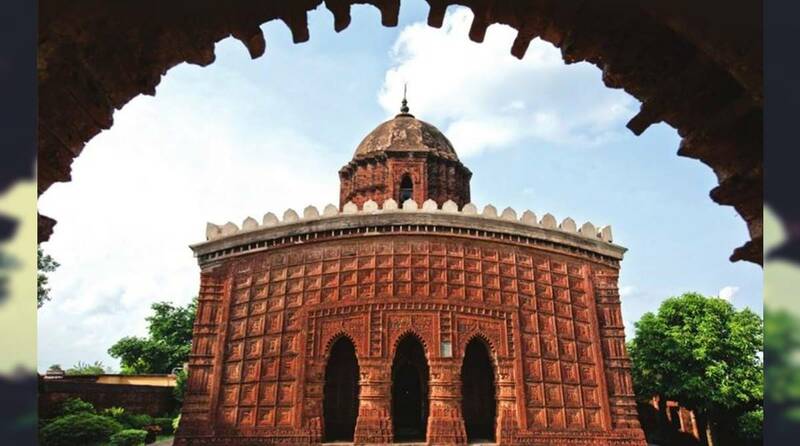 However, the famed Madanmohan Temple of Bishnupur was built more than a century later by the 53rd king of the Mallabhum Durjan Singha Dev (1682 CE to 1702 CE) at Shankhari Bazar area of Bishnupur in 1694 CE. It is the best ‘Ekratna’ (one tower) style temple of Bishnupur. The architecture of the temple with a square flat-roofed building, carved cornices, surmounted pinnacle and a single ‘sikhara’ (tower) has enabled Madanmohan Temple to earn the status of one of the finest sculptures of Bishnupur. The pedestal of the temple is mainly built of burnt earthen bricks on the pedestal made of ‘makra pathar’ (laterite stone). The façade and the pillars of the temple are exquisitely adorned with terracotta panels depicting various events of life of Lord Krishna, Ramayana and so on. Most of the panels are related to the life of Krishna and Krishna Leela, the Ramayana and social life. Besides, there is a mural sculpt where a bevy of beautiful girls in different gestures and shapes forms an elephant. Radha and Krishnan, the two presiding deities, are placed in the sanctum sanctorum of the temple. There is a ‘Nat Mandir’ in front of the temple. Besides, there is a kitchen in the east for cooking daily ‘Bhog’. Banshari Mukherjee, the hereditary priest of the temple said, “Kirtan (devotional songs in honour of Lord Madanmohan) are still performed in chorus in every evening. The kitchen is used for cooking daily ‘Bhog’ (sacred lunch) of Madanmohan.” The main temple precinct is surrounded by a high wall made of burnt earthen bricks. Besides, outside the wall an ‘Indara’ (a Rajasthani well) was dug up for the water used for ‘Nittya Seba’ (daily services) of Lord Madanmohan. However, it seems that Lord Madanmohan has not yet been exonerated from curse. Though Madanmohan and Bishnupur are synonymous, the great Madanmohan Temple is the most neglected of all the prominent temples of the Temple Town Bishnupur. Unlike three other temples that include Rashmancha, Syamraer Temple or Panch Chura Temple (a temple with five minarets) and Jore Bungalow, no initiative seems to have yet been taken on the part of the government and the archeological department to illuminate the Madanmohan Temple at night. Besides, various festivals on the occasions of Dol Yatra, Ratha Yatra and Rash Utsav which were regularly arranged under the aegis of the Kings of Mallabhum in older days, are not observed in accordance with the tradition of temple due to financial crisis. Truly, no tourist can leave Bishnupur without paying a visit to the Madanmohan Temple for it is still the vibrating heart of the Temple Town.